12.27.13 – This touching event flashback could have you reaching for a tissue. "Go" here. 12.20.13 – Step inside the mind of PTC staff and read their first impressions here. 12.13.13 – Grab a seat and enjoy a delicious meal with loved ones, family-style. Be inspired here. 12.03.13 – One PTC dishwasher dishes on what she loves about her job. Appreciate more here. "Parties that Cook was a great hands on team building activity that helped our staff work with staff members they may not work with on a regular basis." "All of our clients enjoyed themselves, laughing, relaxed and chatting with everyone. Frankly, we didn't have to do much to make sure they had a good time - it happened all on it's own!" "Loved our event. Our best annual retreat to date!! Everyone had the best time!" “The best part was seeing our teams come together and bond in a new and unique way. 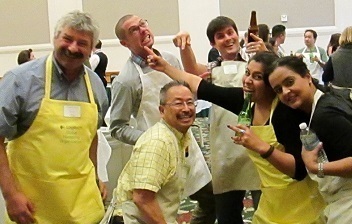 The event was successful because it incorporated so many elements (comedy, cooking, competition, camaraderie!)." Kick Off 2014 with Team Cooking & FUN! If you’re still celebrating a fantastic 2013, it's not too late to book a January cooking party! Already have your sights set on Q1? There's no better way to motivate your team, launch a new product, or simply start the year off right. Engaging and fun for all group sizes, we can handle up to 350 guests at a venue near you. Contact us today to start planning an unforgettable event. 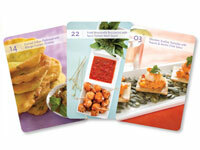 Receive complimentary recipe deck cookbooks for every event guest when you book by January 31. *Not valid with other offers. Only applies to new bookings. New Year, new culinary skills. Cook outside the box with this delicious dumpling recipe. Pulling inspiration from a few Asian cultures, you can find similar recipes in action at upcoming January and February Date Night couples cooking classes! Don’t ruin your appetite dealing with pesky shrimp veins. It happens. Save precious prep time and spare the mess with this secret weapon! Step up your home cooking this year. We know it was on your resolution list! PTC Founder & CEO, Bibby Gignilliat, has the perfect recipe to kick start your goal. The trick is: it’s already super simple! Be amazed by what you can cook here. Couples cooking classes are the perfect way to spice up "Date Night". Give your Valentine a cooking class gift certificate they can redeem anytime throughout the year. Or take charge and plan a romantic evening with Parties That Cook! This Valentine’s Day, special menus featuring aphrodisiac ingredients make things even hotter.